I stopped off this morning for a late coffee at the Parisian Sweet Bar near Parc de Bercy. These sandwiches and quiches were waiting for the lunch crowd. I had some of the broccoli quiche yesterday. The sandwiches looked very tasty. 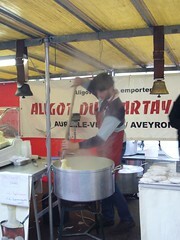 Don’t miss this place if you are near Bercy in the morning or early afternoon. Sometimes, the best way to find a good ethnic restaurant is to ask an immigrant. I say sometimes because I have no idea where to find good American food in this city. I have no interest in eating American food while in France. But I digress. I was shopping at one of the local discount stores the other day. I asked the Indian store owner if he had a suggestion for good Indian food in the area. He quickly suggested Sadika, just around the corner. I knew the place, it is across the street from Antalya, my favorite Turkish restaurant. Sadika is a traditional Indian restaurant. It features the standards: Palak Paneer, Dal Makhani, Samousa, Naan, Korma, etc. 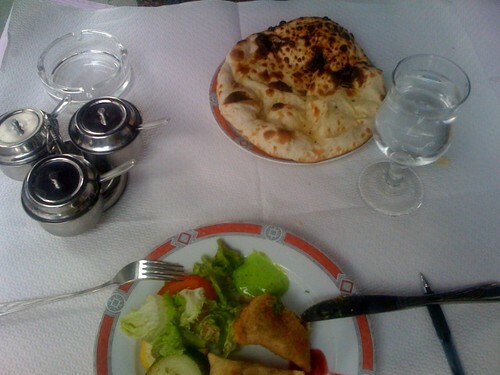 Typical of Indian restaurants in Paris, the meat dishes far outnumber the vegetarian dishes. I keep searching for a true vegetarian Indian restaurant with spicy food. Sadika’s fixed price menus are generous and reasonably priced. I had the basic dinner menu at 13.50 euros. It also started with a Roti and trio of chutneys. The meal also included two Vegetable Samousas, Naan with Cheese, Aloo Palak (spinach and potatoes), Saffron Rice, and my favorite Indian dessert: Gajor Halwa (carrot pudding). Sadika is in the 12th arrindissement near metro: Dugommier (6) and Daumesnil (6,8). It’s a small restaurant and isn’t very crowded. You’ll get good service, friendly waiters, and good Indian food at a good price. I’m still looking for an Indian restaurant in Paris that knocks my Achile socks off. Sadika is the best that I’ve found so far.